Wirelessly charge your Qi-enabled smartphone in-car with this wireless charging car holder. Securely position your device in either portrait or landscape all while enjoying convenient and efficient Qi wireless charging. I haven't used the wireless charging part of the phone holder, but the holder holds even a heavy phone like the S8 with a cover perfectly still. Had high hopes. Stylish, practical, sturdy but stopped charging only after a week of owning it. As a windscreen mount this is great, however as for sticking to the dash not so. I bought for use with my note 9 in an otterbox defender case, and this mount stays fixed on the dash for less than 3 seconds in a stationary car! Hence the 3 stars its half good. It keeps falling off, especially on a hot sunny day. Charging works well through a plastic case and the grip on the phone is sufficient. But the angle f the arm means the holder is top heavy and the suction is not sufficient. Solid feel and build. Hold phone firmly whilst charging. Very happy about my purchase. 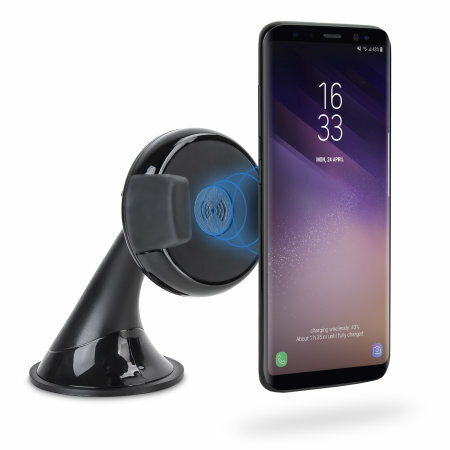 Great wireless charger & compact car mount. So.much easier than trying to get a plug connected into phone. Worked at first but now just gets hot and fails to charge phone - avoid. Iâ€™m very happy with the charger. Well made and solid construction. Grips the top of the dash securely. Flexible positioning. Doesn’t charge my iPhone unfortunately, tried various configurations but couldn’t get it to charge so have ended up using a right angled charging cable. May work better with other phones. The iPhone 6S doesn't support wireless charging out of the box, however we do have Lightning to wireless adapters to solve this issue. Please contact our Customer Services department so we can assist further. Just plugging the cable in is an issue. The wireless charging is random and keeps cutting out Buy a decent product instead. For 2 reasons . I liked the look of it . Simple but nice design and price. Got the charger .easy to setup . It keeps loosing connection .says charging then 2 seconds later says charging paused then charging again then passed .keeps doing this while driving only but when stationary. If this charger had adjustable legs like in i0ttie wireless charger then this would solve this problem as you could adjust it to position where it would charge without loosing charging connection . I would like to recommend it but can't recommend it on quality and design when it would frustrate you to get charge position which could easy be made more easy to find with a adjuster at bottom to hold in position. It would be better if they was a mechanism to spread the holders. Spreading both sides at the same time and placing the phone in between them is very awkward. Otherwise works well. I brought this product to stick on my dash rather than my windscreen. It would not stick to most of the surface area due to the texture so the old place I could stick it to is not at a very good angle for viewing. Charger keeps losing connection to the phone is constantly beeping on and off charge. When connected ot does charge quickly and I expect if I had wanted it for the windscreen I would not have had the angle and sticking issue. Wireless Charging - seems like a myth to me!? I dont want to be too critical because I have read lots of items saying its Samsungs problem. The facts are; I hate all those wires and plugging in getting into the car so this seemed the ideal solution. Problem is, its a bugger to get your phone in the cradle - 2 hands definitely required. When I locate my Note 8 it lights up and reports, "Wireless Charging"! Hoorar.... 10secs later, lights up.... "Wireless Charging Paused"... 10secs later, lights up.... And does this for the whole 1.5hr journey and doesnt charge the phone! Sorry if its my phone but, thems the facts. Fits nicely to the windscreen and holds S9+ well with only a little movement. Wireless charger works through my Zizo tough case ok. Need 2 hands though to insert phone. Got the universal one as was not too sure where exactly the Qi module is located on my fevice. Nice design, adjustment range is great. Holds firmly to the windscreen so and the phone. Comes with the usb cable. Everything as I wanted, fully recommended! Nice not imposing phone holder. Love that it’s wireless. Doesn't even charge!!! Set off on a 15 minute journey with 20%, got there with 15%!!! Sorry to hear you have an issue with the charger, Could you email our Customer Service team so they are able to resolve this for you? Used it in my Kadjar and it fits great down near the subs and it is solid and holds the S8 with no problem. Very happy with it and charges the S8 fast.